Hardcover, 11.5 x 9.5 in. / 96 pgs / 46 duotone. 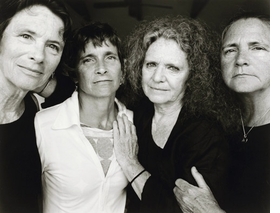 In August 1974, the photographer Nicholas Nixon made a group portrait of his wife, Bebe, and her three sisters, Heather, Mimi and Laurie--the Brown sisters. He did not keep that image, but in 1975 he made another portrait of the four, who then ranged in age from 15 to 25. Working with an 8 x 10-inch view camera, whose large negatives capture a wealth of detail and a luscious continuity of tone, Nixon did the same in 1976, and this second successful photograph prompted him to suggest to the sisters that they assemble for a portrait every year. The women agreed and have gathered for an annual portrait ever since. Nicholas Nixon: 40 Years of the Brown Sisters celebrates the 40th anniversary of the series with luminous tritone reproductions of all 40 portraits and a new afterword by Sarah Hermanson Meister, which examines the series' public exhibitions, critical reception, and cult following. 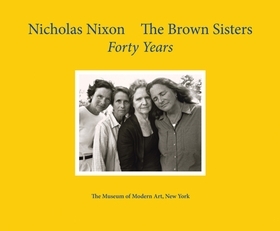 Like the previous editions of the series, published in 1999 and 2008 for its 25th and 33rd anniversaries (both out of print), Nicholas Nixon: 40 Years of the Brown Sisters is a milestone in an ongoing project that we hope will continue for many years to come. Sarah Hermanson Meister became a Curator at The Museum of Modern Art in 2009, having joined the Department of Photography in 1997 as a Curatorial Assistant. Ms. Meister has organized a number of exhibitions for the Museum, including Picturing New York: Photographs from The Museum of Modern Art, Eugène Atget: “Documents pour artistes”, Pictures by Women: A History of Modern Photography (with Roxana Marcoci and Eva Respini) and the photography galleries within Abstract Expressionist New York: The Big Picture. 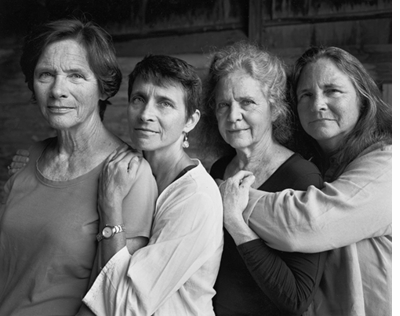 "The Brown Sisters, Truro, Massachusetts" (2013) is reproduced from Nicholas Nixon: The Brown Sisters. Forty Years. These subjects are not after attention, a rare quality in this age when everyoen is not only aphotographer but often his own favorite subject. In this, Nixon has pulle doff a paradox: The creation of photographs in which privacy is also the subject. The sisters' privacy has remained of utmost certain to the artist, and it shows in the work. Year after year, up to the last stunning shot with its triumphant shadowy mood, their faces and stances say, Yes, we will give you our image, but nothing else. 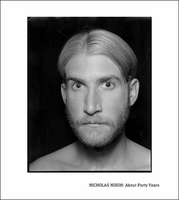 Back in Stock: Nicholas Nixon: The Brown Sisters. Forty Years. FORMAT: Hbk, 11.5 x 9.5 in. / 96 pgs / 46 duotone.